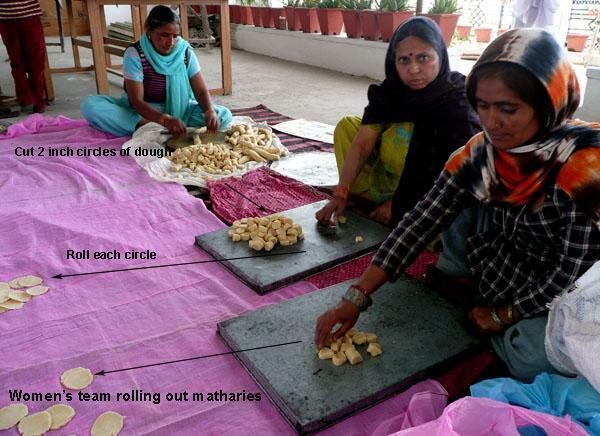 The pictures here show matharies being made in bulk by a professional team of cooks. This usually includes either a group of women or young apprentices who do all the preliminary work. 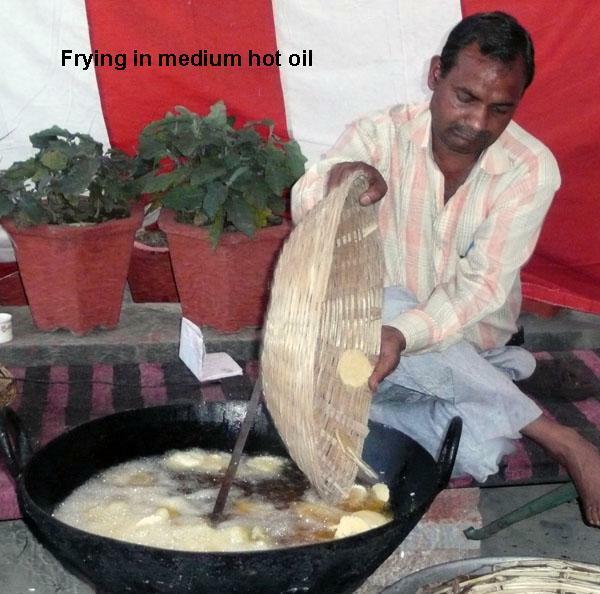 The deep frying is carried out to perfection by the main cook. Matharies are the staple snack of most North Indian homes. They are eaten for breakfast, as snacks with tea, taken on journeys and are ever ready for those unexpected guests we Indians tend to have a lot of. They are the Indian substitute for biscuits. You can make them with Western style short crust pastry. All you have to do is add a few carom seeds to the pastry, roll and cut like biscuits and bake in a pre-heated oven at 180° - 200°C for 30 minutes or so, until they are cooked crisp. Made this way, they are a lot more friable and don't last as long as fried matharies. They are usually eaten with pickles, but in my parent’s house, we always had them with Sweet Mango Chutney. 1/2 cup whole meal or chapatti flour (Optional). You can use all plain white flour instead. Place all dry ingredients and 1 coffee cup oilin a food processor or bowl and mix, like a pastry mix. Make a VERY firm dough by adding a small amount of water at a time. I add only a tablespoon at a time. You can make the dough by hand too, but it is hard work. Divide the dough into large balls and roll them into thick ropes. Cut into 2 inch pieces. Roll each piece to a 2 inch diameter biscuit. Stab each biscuit with a fork a few times. This stops them from fluffing up during the frying process. If they fluff up, they will get soggy when cold. If it is a warm day, keep them covered with a wet piece of muslin. Heat the oil to medium hot only. If cooked in very hot oil, matharies will get soft like Poories. The trick is to cook them very slowly on medium heat. To test if the oil is ready, drop a mathari in oil. It should sizzle and rise to the top slowly, not too fast. 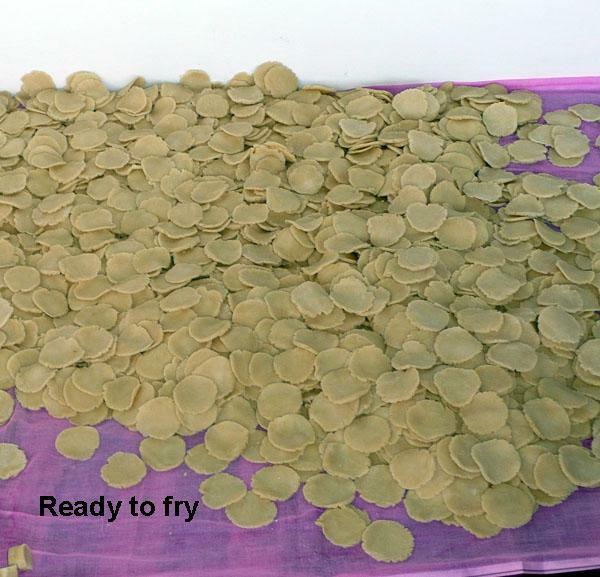 Fry in small batches, until nicely golden brown, not too dark. Take out with a skimmer or slotted spoon and place on an absorbent paper. 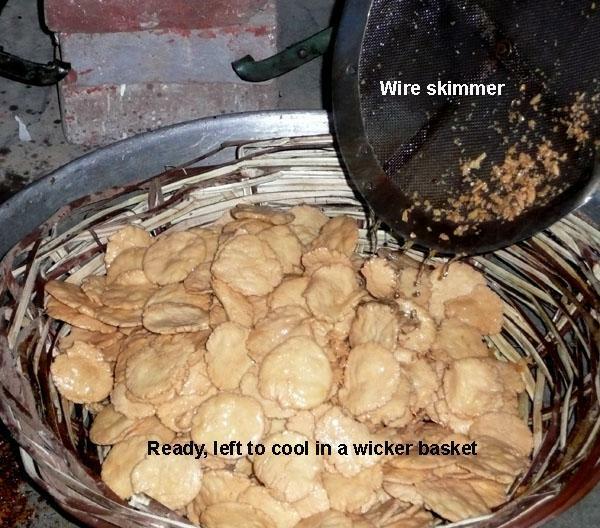 The professional cooks place them in a ‘jhari’ or a wire sieve to drain all oil. When ready, matharies should be hard like a biscuits. Cool completely and store in airtight jars. Serve with a pickle of choice and Sweet Mango Chutney. 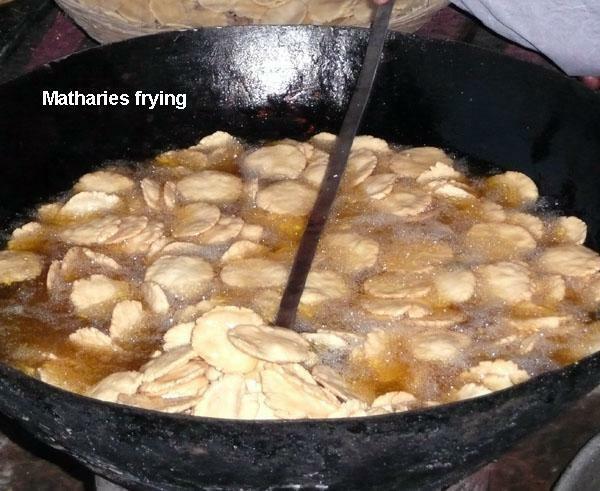 They can be served hot, straight from the karahi or wok, with a hot cup of tea and pickles. *For adding different flavours to the matharies, you can add these to the dough; 1 tablespoon of dry/Kasoori methi (fenugreek) leaves or 1 tablespoon of oil and spices from a jar of mango or other pickle.